It’s Photo Friday again. Brought to us of course, by Debbie at DeliciousBaby. 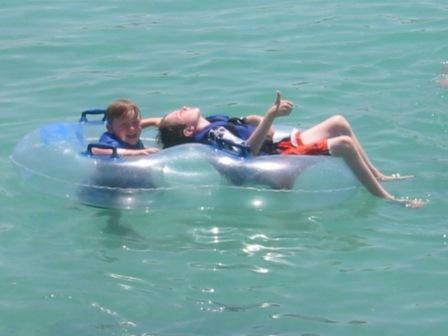 My photos this week were taken in Mexico in 2006 (when CAM and BigB were 10 and 6 respectively). We planned our summer vacation gambling on the weather that year: we vacationed on the Mayan Riviera (the Caribbean cost of the Yucatan peninsula) in August. I must have checked the hurricane watch on NOAA daily for weeks before we left. Yes, it was a little crazy, but it was also darn cheap. We also avoided Cancun, Playa Del Carmen and all the purpose-built resorts. We stayed in Akumal, a little pueblo between Playa Del Carmen and Tulum. There’s very little in Akumal except the beach, a grocery store, a dive shop and the Ecological Center – which suited me just fine. As it turned out, my husband had to change his plans at the last minute (work, work, work). So I ended up traveling with the kids alone. (He joined us later). We relaxed on the beach for the first couple of days but it didn’t take long for me to get ansty with all that sitting still. I bargained with my kids. 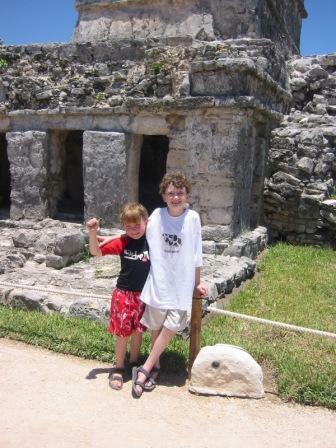 I wanted to go explore Mayan ruins, they wanted to check out the water parks they’d seen advertised on the roadside. We compromised: Tulum first and then the water park. Tulum was cool. Naturally they were reluctant at first, but they got into it. The game of the day was to pretend Mom was a Mayan princess and find a suitable place to sacrifice her. (CAM’s idea). It was enough to have them chasing around the site, map in hand, looking for a place to push me off into the sea. CAM and BigB taking a break from their schemes to sacrifice their own Mayan princess (i.e. Mom). This entry was posted in International Escapades, Mexico and tagged Akumal, Mexico, Tulum, Xcaret, Yucatan on September 12, 2008 by wandermom.